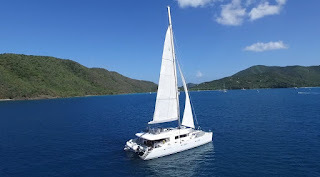 Brett and Mallory on Catamaran SERENITY NOW are looking for that one more charter in May 2018 for the Virgin Islands. Make a reasonable offer and you could be sailing for a week aboard this spacious 62-foot catamaran in May. Serenity is a 62-foot Lagoon catamaran with a crew of two. The yacht is fully air conditioned and accommodates up to 6 guests in 3 cabins, each with Queen bed, TV, and ensuite facilities with shower stall and electric toilet. Captain Bret is a dive instructor and 8 dives/week are included for certified divers. See more dive info: HERE. Plenty of watersports, space, and fun. 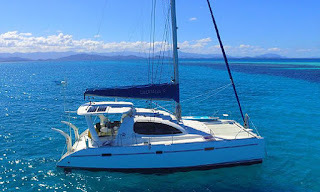 SALTY GIRL (a 40-foot, 3-cabin Leopard catamaran) is offering special rates for guests wanting more than a day-sail, but who do not have the time or are not ready to commit to a full weeks' charter. While many charter yachts will not accept a booking for less than 4 or 5 nights, Tresa and Philip are happy to offer these trips, specifically designed to tempt villa and resort guests into giving yacht chartering a try. Many villas and resorts are still closed for repair caused by September's hurricanes but the charter yacht sector bounced back fairly quickly. The beach bars didn't take much to get back on line and we still have excellent diving & snorkelling. Fewer cruiseships and resorts means more Paradise for you! Come on down and charter Catamaran Salty Girl for the weekend. Mid-week works, too, as well as full weeks. Don't you deserve a quick getaway? Inquire and find out if your dates are available! View Salty Girl's online brochure to learn more. Contact Paradise Connections: Send us an email for info and current availability. The following special rates are for all-inclusive charters (boat, crew, full board, use of boat's "toys", port taxes and permits, air conditioning, etc). Special offer expires August 31, 2018 and may not be combined with any other special offers. We would like to welcome FOUR new yachts into the charter fleet. We will do an individual post for each boat but, in the mean time, here's a sneak peek! Have QUESTIONS or you'd like to BOOK A CHARTER? Contact Paradise Connections.